Back-to-school season is among us, which means college parents everywhere are charging power tools in anticipation for a battle with IKEA dorm furniture. Aside from the headaches of move-in day, a new school year is the perfect opportunity to have the “Money Talk” with your college-age children. Financial habits form early. Trusting your children with the financial realities of college can be a life-changing learning opportunity. Below are some practical talking points to help you get the conversation started. Debt is the result of spending money before you have it. Loans and credit card purchases are promises (made by you, to the lender) that you will pay back the total amount borrowed, and then some. Lending companies give you a grace period to pay off the debt, and after that, the interest starts kicking in. Interest is the money owed (by you, to the lender) for delaying the repayment of the debt. As a borrower, you agree to the interest rate and payment frequency beforehand. Interest can accrue annually, monthly, or even daily. Minimum payments are not offered by lenders as a courtesy. If you are paying the bare minimum on debts like credit cards and student loans, you could find yourself paying a lot more money in the long run. For example. Let’s say you’re getting charged $50 in monthly interest, and only paying the minimum payment of $30. Even though you paid $30, you are now $20 MORE in debt than you were before! And next month, you will be charged interest on that extra $20 of interest. And so, the cycle continues…. Paying interest on your interest is called “compounding,” and it can be your worst enemy. With compound interest, your debt doesn’t just grow- it multiplies. Credit card interest is extremely complicated. You can find a good summary on how it works here. Compound interest can also be your best friend, because it works in the other direction. When you invest in a college savings plan or a retirement account, your contributions can begin earning interest that compounds over time. Let’s say hypothetically you have an investment account with $10,000. It has an average annual return of 7%. This means you can expect to earn around $700 (or 7% of $10,000) in interest if you leave your money alone for 1 year. What happens if you add another $150 to your account every month for 50 years? In this example, you paid only $100,000, but earned $926,612 in compound interest. It pays to save early and often! As a young adult, time is on your side. 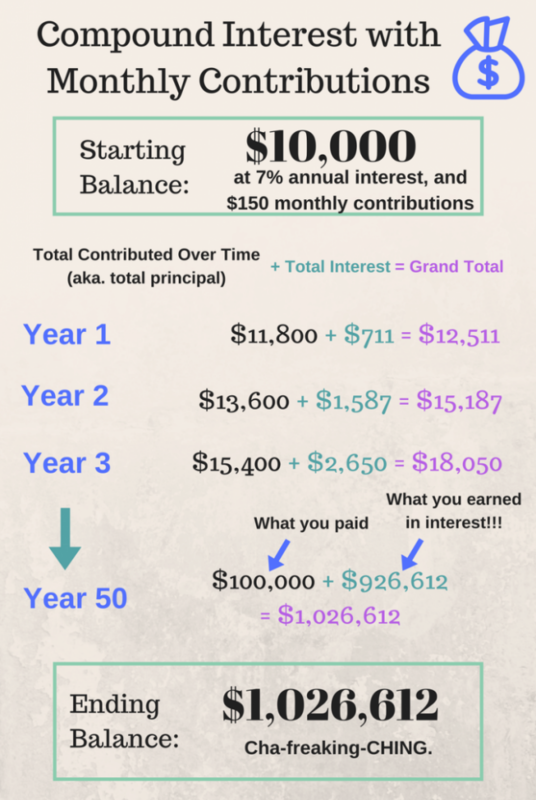 Let compound interest work for you while you’re not looking. Twelve percent of college students don’t check account balances because it “makes them too nervous.” More than half of college students lie to their parents about their spending habits at school. This is a destructive financial strategy. Accepting your financial limits and creating a plan to live within your means are both part of becoming a well-adjusted adult. In other words, welcome to the real world, kid! If your college student is already in debt, you can direct them to this post: What is the Best Way to Pay Off My Credit Cards? Campus mailboxes are getting inundated with credit card applications. College seniors have reported junk mail solicitations that include a real credit card with the student’s name on it, which can become fully functional after activation. No application needed. The urge to keep up with your peers is a social pressure that will exist for the rest of your life. Remember this- just because your friends are spending a lot of money, doesn’t mean they have a lot of money to spend. You may know a lot about your best friends, but you will never know their full financial situation. Appearances can be misleading. When it comes to money, run at your own pace. Parents should have an open line of communication with their kids about money. Make sure your college-age children know they can ask questions and seek out financial help without judgement. Debit vs. Credit: What’s the Difference? Debit cards spend money you already have. Each charge deducts money electronically from a checking account in the user’s name. Debit cards cannot hurt your credit score, which makes them an excellent proving ground for young spenders. Credit cards spend money you promise to pay back later, by a specific deadline. If you fail to meet that deadline, you pay interest and penalties. Missing credit card payments also hurts your credit score in the long-term, which will sabotage your ability to buy a car or a house someday. This could be an entire conversation on its own. Americans owe over $1.4 trillion in student loan debt, spread out among about 44 million borrowers. All college students should know the basics of your loans. Are they federal or private? How much do you owe in principal? What are the interest rates on your loans? On your current payment schedule, how long will it take to pay them off? Should you adjust your payment strategy to pay off the debts quicker? When does your grace period end? Can you start making early principal payments before the interest kicks in? If you can’t make early payments, are you setting aside money each month to start paying off your principal debt as soon as humanly possible? The earlier you develop a student loan strategy, the better. College-sponsored swipe cards and debit cards are real money, even if they don’t feel like it. That money is coming from somewhere, so if you’re not paying for it, your parents are. You should understand the true costs of your meal plan, laundry, and school store shopping sprees. These costs should be incorporated into your monthly budget. College students should get in the habit of creating a monthly budget realistic to their life goals. There are two types of expenditures in a budget: wants and needs. Needs are expenses we need to survive in this world: housing, food, gas, health care, etc. Wants are things that make life just a little more fun: dinner at a restaurant, new clothes, vacations, premium cable, etc. You should make a list of recurring expenses, and review checking account statements (or keep receipts) for gas and grocery bills to figure out their average monthly costs. Next, calculate how much money you have coming in the door. Parents can help with financial needs, but students should begin learning how to independently finance their wants. How much money will your parents contribute each month? Are you expected to get a part-time or summer job to supplement this income? If you finish your budget and realize you have more money going OUT the door than coming IN the door: it’s time to start cutting out some of those “want” expenses. Living within your means can be a bummer sometimes. Like I said before, welcome to the real world, kid! 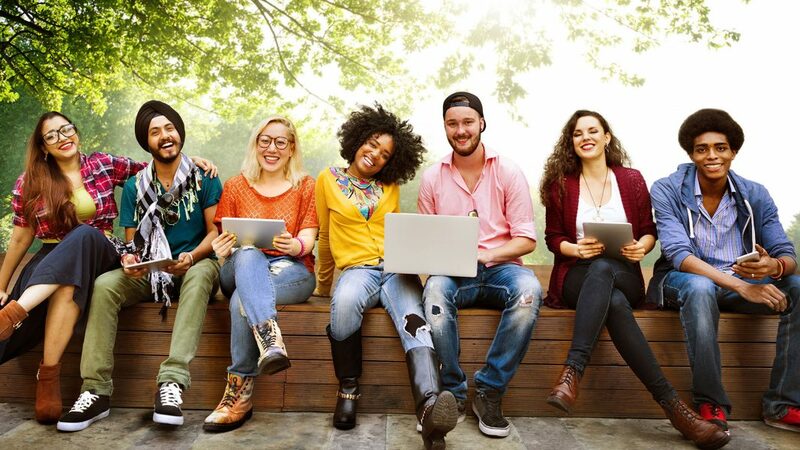 Want to get a head start on your post-college lifestyle? Include a section in your budget called “Emergency Savings Fund.” This money can be used later to pay off student loans, or put a down payment on a post-college apartment. Parents beware! Don’t blow your retirement by funding your children’s post-college lifestyle. The college years are a golden opportunity to gradually take children off the family payroll. You are giving your children the gift of room, board, and tuition. The rest should be slowly incorporated into their personal budgets. Give yourself permission to start cutting out your student’s luxury expenses without feeling guilty. Remember all those diapers you bought for them back in the day? You have earned this moment! Even if you can afford to treat your kids to extras, it denies them the opportunity to figure out these budget challenges on their own. If you are expecting students to live in their own apartments after college, you should make that known immediately to give them time to save for a down payment. College years are a difficult time for parents. We already stress about things like safety, grades, and drinking. Money doesn’t have to be on your list of worries! Talk personal finance early and often with your kids, and they will thank you for it…. eventually. These are the opinions of Bodnar Financial Advisors, Inc. and not necessarily those of Cambridge, are for informational purposes only, and should not be construed or acted upon as individualized investment advice. Indices mentioned are unmanaged and cannot be invested into directly. Past performance is not a guarantee of future results.